We are proud to announce that we have been awarded Konica Minolta's coveted Pro-Tech Service Award for an unprecedented eighteen years in a row. This prestigious award is earned by select dealerships in recognition of exceptional commitment to customer service and satisfaction. The Pro-Tech award symbolizes our commitment to you, our valued customer. It is your assurance of professional, reliable service and maximum performance for your Konica Minolta office equipment. Our Certified Service Technicians and Account Managers are available to assist with any questions, comments or concerns you may have regarding the operation of your company's equipment. 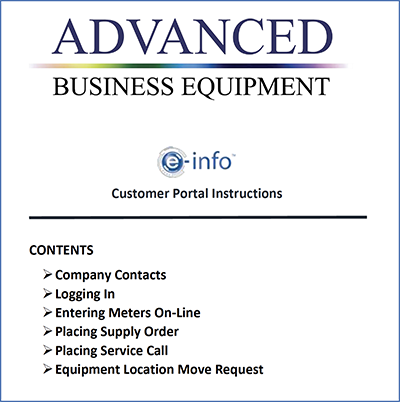 Whether you have a question regarding toner usage, functionality of advanced features or basic machine key operation, Advanced Business Equipment has the answer! For support requests, please login to our e-info center. Existing Customers: Please click the above link in order to log-in and place a service call, order supplies, or enter meter readings. View our new e-info instruction booklet! For quick technical support you can have a technician remote into your workstation or server within just a few minutes. Instead of waiting for an onsite visit, call our Help Desk at 877-212-4316 to get an access code so we can get you taken care of.